In this post, I look back on the posts in this series, reflect upon the journey we’ve made, and think about what 2019 might hold for us. The holiday season is pretty much upon us, and for many it’s a time for bringing things to a close, with a view to getting some rest and making mental room for what’s to come next year. So it is with me and this series. I started this series back in March, not really paying too much attention to the regularity that the title of the post suggested. I made things worse, as it were, by writing a second Monday morning thoughts post on the following Monday. Thereafter I had some folks reach out to me saying that they were looking forward to the next instalment. Whoops! What had I done? I hadn’t really set out with the intention of writing each and every Monday. I’d thought I’d write on the occasional Monday here and there. I guess it all turned out OK in the end, and perhaps even became a nice challenge for me, to write something weekly, something that was hopefully interesting, relating to aspects and ideas in our SAP ecosphere and beyond. 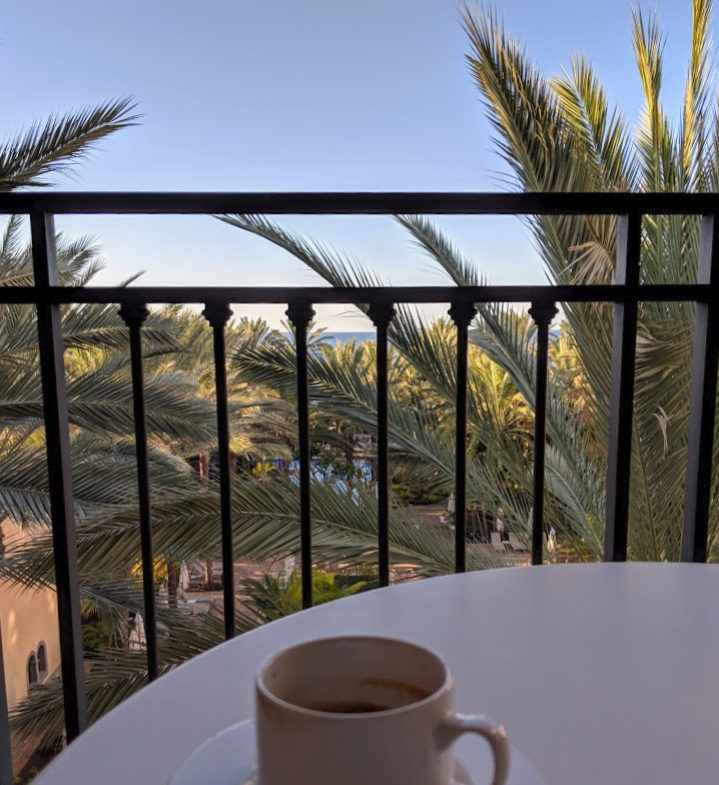 Perhaps it even became a micro obsession of mine, as I found myself publishing a post on my birthday (Considering GraphQL) and another from the balcony of our hotel room in Gran Canaria (on longevity and loose coupling). That’s not to say that I’m encouraging you to write on your days off – but perhaps I am suggesting that you should follow your passions and do what you feel is right. I’ve had the privilege of publishing audio recordings of a few of the posts on Jakob Kjaer and Simon Kemp‘s excellent podcast show Coffee Corner Radio and have been surprised and delighted to find folks coming to say hello at the SAP TechEd locations this year saying they’ve been reading and enjoying the posts. In total, including this one, there are 38 posts in the series and they’re all available via the usertag “mondaymorningthoughts” (hurray for folksonomy systems). If you’re curious, yes I did write them all on each Monday morning; while I might have mused on topics over the weekends, it would have been only semi-consciously; I got to grips with the subjects at hand there and then at the very start of each week (often helped by a run before dawn – my favourite time). Talking of curiosity, I was wondering this morning what the dominant subjects might turn out to be. So this morning I grabbed all of the user tags from each of the posts, cleaned them up, and fed them into a tag cloud generator. In one sense, what it produced was not unpredictable. 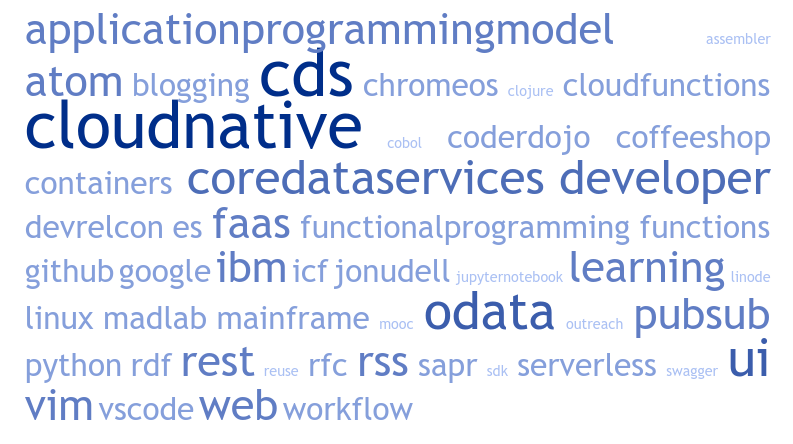 But what I noticed was that the largest tag, cloudnative, was the subject of, even the title of, my very first Monday morning thoughts post: “Cloud Native“. This made me smile, but also reflect on where we are in the SAP Cloud Platform journey together. And I think that’s what I have in mind when I think of 2019 and what it holds in store for us. We’re moving ever closer to open tools, standards & processes, with Cloud Foundry as our new bread & butter, and with Kubernetes, Knative and concepts the 12 factor app being understood and embraced. Moreover, we have serverless offerings becoming a reality on SAP Cloud Platform, with functions, messaging and backend as a service features available now. 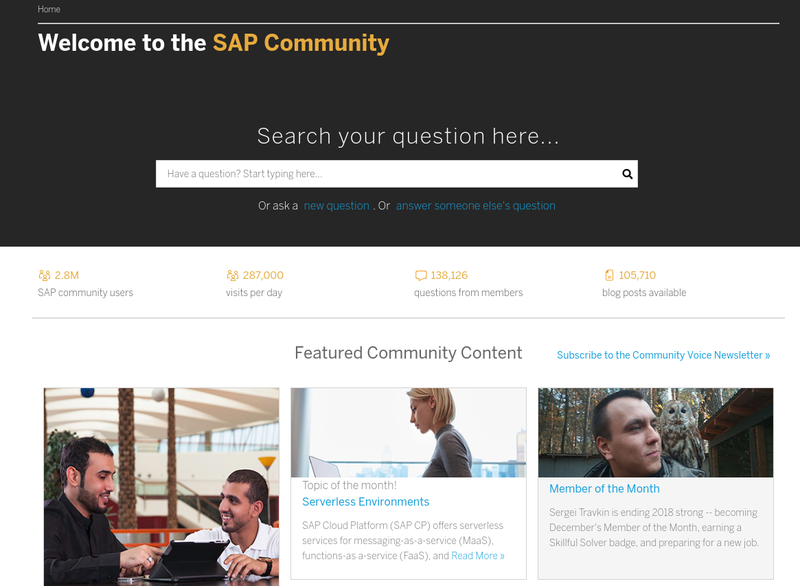 Serverless is even topic of the month here in the SAP Community! So 2019 has lots of exciting things in store for us. What I know for sure is that we’ll continue to learn, with new topics to embrace and existing topics to master (see “digging deeper“), and we’ll continue to grow as an ecosphere and as a community. This then marks the end of the Monday morning thoughts series, at least in its current form. I’ve really enjoyed writing them, and that’s mostly because of you folks – your comments, engagement, and conversations that have started because of what you’ve read. Thank you, enjoy the holiday season, and I look forward to seeing you in the new year! This post was brought to you by Pact Coffee’s La Valentina, the happiness of the prospect of some downtime, and a slight sadness that this series is over. I just love the way you articulate and inspire. “Monday morning thoughts ” is a great series. No more Monday morning waiting for your blog post ..😀. Looking forward for what you’ll come up next. Thank you for sharing your thoughts on a weekly basis! Enjoy your holidays and thank you for letting us know about Pact Coffee! Thanks once again one of the reason for the great 2018 has been your Monday morning thoughts for sure .